I love being in the kitchen, and don’t mind putting in the time to make yummy treats and meals for my family and friends, but if there are tips and tricks to make things easier, food last longer, and my kitchen run more smoothly then I am all about that. I have collected a group of my favorite Kitchen Hacks and wanted to share them with you. Here are 16 Kitchen Hacks that I have found and fell in love with. There are so many, but this is a good start. All of them are simple and will save you time and money! Be sure to pin it or share it to Facebook so you can reference it when you need to. Freeze fresh herbs with melted butter or olive oil in an ice cube tray and keep frozen until ready to use. This is such a great idea. Your herbs and oil/butter are ready for recipes. Use a push pin to poke a hole before boiling for 8-10 minutes. Cool completely then peel for a perfect hard boiled egg. This will infuse the flavor into the fish and it won’t stick to the grill. This would be great for Chicken and pork as well. Cut slices of Lemons and Limes and put them into a muffin pan. Fill the pan with liquid (can use water, punch, tea, or other liquid to prevent diluting) and freeze over night. Remove ice cubes and put into pitcher with liquid. Instead of cooking your hash browns in a greasy pan, spray your waffle iron and layer the hash browns and close the lid. 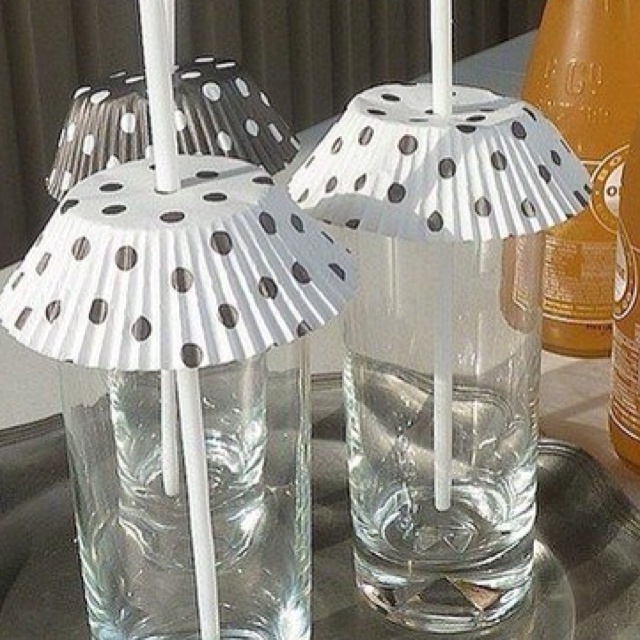 Put a straw through a cupcake liner to act as a lid for your drink to keep bugs out. This is a great idea, especially for holidays – to have a themed party accent. I love this idea! I am going to use it for all of my small spice jars that take up to much space in the rack. Hang a rail under your sink or in your pantry to hang your cleaning products on. This is a great way to use up the wasted storage space under your sink. I am also thinking about doing this in my pantry. A great way to store bottles that hang. Wrap the ends of your bananas in plastic wrap to extend their life. We love bananas but sometimes we buy to many. If you wrap the ends of the bananas in plastic wrap, it extends their life up to 3-5 days. Remove the white center core and the stem. Just start at the bottom and push the straw through the strawberry and when it comes out the top it will take the core and the stem with it. Store apples and potatoes together for extended life. Do NOT store potatoes and onions together. The ethanol from apples keep the potatoes from sprouting, extending their life. You should not store apples with other fruits as they will both spoil faster. Chop green onions and put them into a dry plastic water bottle and freeze them, then you can use them as needed. I love this idea! We use green onions all the time and this will make life so much easier. Use a clean, dry, empty water bottle and fill it with clean, dry chopped green onions and then you can stick the bottle in the freezer. You can pull the bottle out, sprinkle onions out, and then stick the bottle back into the freezer. They loose a bit of their crispness when you do this, so it is best for baked dishes (slow cooker too) within three weeks. You can write the “expiration date” on the bottle after you have filled it. The best way to store mushrooms is to take them out of their container, lay a few paper towels in a perforated plastic bag (like a produce baggie) or a paper bag and put the mushrooms into the bag (like a nest). Keep them in the fridge. I am not a huge mushroom fan, but my family loves them. This will come in handy. I have done this for a few years, and it works perfectly. I love how crisp and fresh the lettuce stays when you store it in a glass jar with the lid on tight. You can use a mason jar, or we reuse jars from our spaghetti sauce that are larger. You can also make your salads in the jars and have them ready to go. Put a couple of marshmallows into a resealable bag or container with your brown sugar to keep it soft. Put a cupcake liner under the ice cream or Popsicle on the stick to avoid dripping everywhere. I wish I had thought of this years ago. It would have saved me cleaning up so many messes from my kids. Just take a cupcake liner and poke a little hole in the middle, then put it on the stick under the ice cream or Popsicle to catch most of the mess from dripping and melting. I have also seen this with Styrofoam and paper cups. I would love to hear more about what tips and tricks you use. Please leave a comment sharing a tip with everyone, especially me. I have a lot to learn, lol. I definitely needed to read this article thank you for sharing! Will definitely try these kitchen hacks. Thank you for sharing. Keeping bananas from turning brown with the plastic wrap didn’t work for me. However, you can put them in a brown paper bag and put them in the refrigerator. The peel turns brown; the banana stays nice. I haven’t tried the brown paper bag. Thanks for the tip! I love the boiled egg hack. Love the tic tac container idea for spices. These are some really great hacks. I really love the cupcake wrapper with the straw to keep out the bugs! I’m with you, I don’t mind kitchen time but if there is a way to shorten it…bring it on. 🙂 I’ll be trying the banana trick today. I must check out the egg tip! Sometimes I can peel hard boiled eggs with no problem, other times they look like they’ve been attacked by a butcher. I LOVE these hacks! Especially the herbs in butter! I hadn’t heard of most of them, but your collection is great. I put my onions (haven’t tried chives) in a ziploc and push the air out, they last longer. Had no idea about storing potatoes and apples together, I’ve always done the no-no and stored my potatoes and onions together. This is good to know. I didn’t realize that it changed the flavor.